Below is the day by day itinerary for the eight day Lemosho route on Mount Kilimanjaro. The eight day Lemosho route variation is the ideal schedule for this route. On the 8 day Lemosho route, the trek from Barranco to Barafu is broken up into two days, allowing for a short day just prior to the summit attempt. This is important because summit day begins very early, around midnight, so climbers are sleep deprived going into the toughest day on the mountain. By having a short day beforehand, climbers can be better rested. 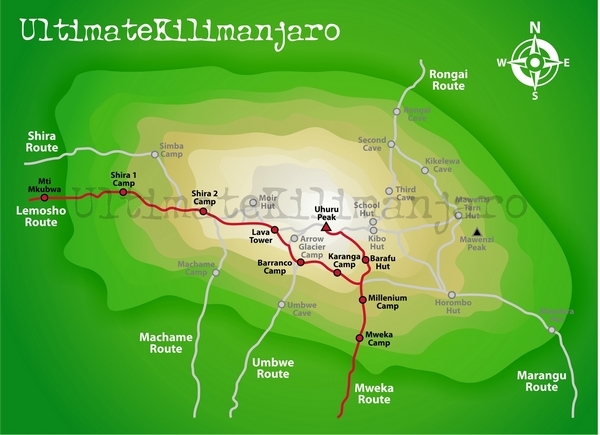 The eight day Lemosho route is highly recommended and used by most prominent Kilimanjaro operators. © 2008-2019 Lemosho.com | All Rights Reserved.